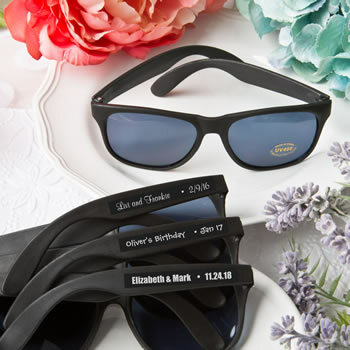 Turn your event into a fashion show when you give each guest a pair of cool black personalized sunglasses! Add a quirky touch to your event when your guests find a pair of sunglasses on their tables. They feature a classic design with two separate lenses and a nose bridge. These stylish glasses are made from a black plastic and sport a gold sticker offering 400UV protection. The sunglasses can be personalized with a clear sticker printed in white print in a choice of multiple fonts, creating a meaningful, useful and different favor. Size of frame is 5 1/4" x 1 3/4"
Sunglasses are not engraved. Personalization is a on a label. SIMPLE ASSEMBLY REQUIRED. Sunglasses do not come with sticker attached. You will receive one sticker for each sunglass ordered. Make a fashion statement at your next event with these fun sunglasses from Fashioncraft! I ordered Black and white glasses for my dads 90th birthday.The glasses are little large but nice. I wish the lettering on the stickers was a little bigger. Overall I am happy with my order. Glasses are fine. Was not expecting that the personalization were stickers that i had to apply to glasses. Thankfully i only had 40 to sticker. Product shipped quickly. Nice price favors was AWESOME!! Fast delivery, easy website to maneuver through and made our wedding day very special. Every one our guests will always have a pair of personalized shades to remember our wedding day. We went tubing for my birthday and I didn't want anyone to lose their good sunglasses in the river so I bought these. They were perfect. Much better quality then you would expect for the price. The glasses arrived promptly and were simple to put the stickers on. A great affordable option for personalized sunglasses. Great glasses that look good on everyone! Customer Service @ NicePriceFavors is the BEST! Overall great experience with my order. The customer service team was quick to rectify an error I made on my order. The product came within a week or so! The only issue which is why I didn't give 5 stars, is I wasn't aware that the sunglasses would be plain and I'd get 320 personalized stickers that I'd have to place myself on the sunglasses! I was very pleased with the look of the sunglasses. I haven't tried them out in the sun so hopefully they will hold up once they are being worn. Fabulous favor idea, guests loved them! Received glasses in a timely manner. Font could have been little bigger but am satisfied with product and glad to have few extra stickers because i did mess up few. These sunglasses were a great favor for my summer wedding! These will really be a hit in AZ in May. The order shipped and got to me very quickly. I wasn't expecting my order so soon. I didn't know that the glasses had stickers that I have to put on. I was hoping the words on the glasses were put on another way other than sticky paper but overall I was pleased with my order. I will use nice price favors again.